The Ling-Temco-Vought A-7 Corsair was designed for the US Navy as an attack aircraft to be operated from aircraft carriers. Vought Aircraft was purchased in 1961 by Ling-Temco Electronics and LTV was formed. 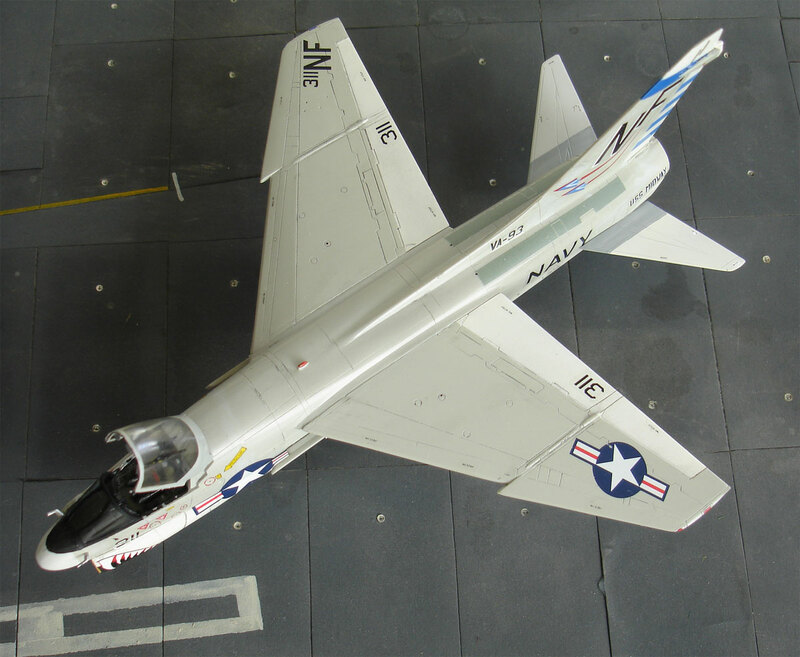 Experience of the fighter Vought F-8 Crusader was used in the A-7 Corsair II design but the airframe was kept simple as it was to fly subsonic only in the attack mission profile. It got integrated navigation/attack and weapon release systems that were very accurate. Initially on the A-7A and A-7B two 20mm guns were fitted, but later variants like the final A-7E got a single M61 Vulcan canon on the left side under the cockpit. The type was equiped with one and TF-30 later TF-41 turbofan engine without afterburner. It had a round intake with air duct below the single pilot cockpit tub with a shoulder wing that could accommodate six wing pylons. Also two pylons on the fuselage sides were installed to fit air to air Sidewinder missiles for self defense. Various stores could be fitted on the pylons including fueltanks. First A-7 prototype flight was in 1965 and the type entered service in 1966 with the US Navy. The US Air Force also was interested in the type and the A-7D was used by them with minor modifications such as adding a flight refuelling receptable on the upper fuselage as compared to the Navy variants. They also got their two seater variant, the A-7K used by the Air national guard. 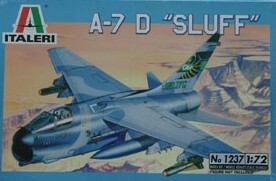 A USAF nickname used was SLUFF. 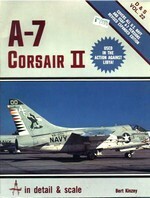 In Vietnam, the A-7 was extensively used. About 1600 aircraft were manufactured and the last A-7 was operational with the US forces around 1994. Some foreign air forces also purchased the A-7 eg. Greece got a variant of the A-7E called A-7H, Portugal got re-built A-7A called A-7P and also Thailand obtained the type. Two seater TA-7C trainers were also made from converted A-7B and A-7C planes in 1976. Forward of the wing a fuselage plug of 40,64cm elngth and aft of the wing of 45,72 cm was inserted. Sixty planes were converted. The cockpit canopy is obviously longer and hinges to the right. In the nineteen eighties some of these planes were also upgraded, with new engine and probably Stencel SJU-8/A ejection seats. The TA-7C is the navy version of the twoseater, the A-7K being the USAF twoseater with the refuelling installation. The TA-7H was the Greek twoseater variant which received 5 planes. In the mid nineties, Thailand got second hand aircraft. Technical data A-7E single seater: length 14,06 m; wingspan 11,80 m; empty weight about 9000 kg; max takeoff weight about 19000 kg. Max speed about 1040 km/hr; Range about 1200 km, ferry range 4600 km. In 1/72 scale several kits of the A-7 have been around, notably old kits from Revell in various boxes (A-7A kit H117, A-7D kit H133, kitno 4100, 4391) . 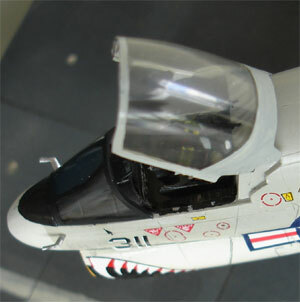 Airfix had the kit 03016 for a A-7D/E in their series 3. This kit was long the best kit in the seventies. Heller also issued the same kit, but with paints as well. 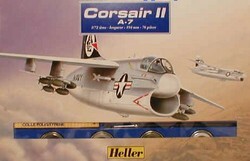 Hasegawa also issued the A-7A and A-7E in this scale which were not too bad. AMT as well as Testors also issued Airfix (?) kits under their labels in the USA. Matchbox also issued a kit (no.PK-101) for the USAF A-7D with the familiar multi coloured plastic and very basic detailing. Also ESCI and Italeri issued kits, such as for the USAF kitno. 1237. All these kits were made obsolete with the coming of 1/72 Fujimi kits with several versions, boxes and decals. Fujimi came with kits A-7A box F12 , A-7B box F10, A-7E Desert Storm, A-7E box F09 (25009), (72013), (720135) and A-7D (250113) and in Flying Tiger scheme box F11 (25011). The Fujimi kits were a vast improvement over the older Revell, Airfix and Matchbox kits. All these kits were single seaters, with TA-7 twoseater conversion sets from Falcon, Maintrack, RVHP. 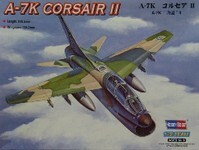 In 2008 also a new brand came on the market with HobbyBoss from China issueing several A-7 1/72 kits, including a TA-7C twoseater and an A-7K twoseater. These kit are a large improvement again for 1/72 scale modellers having recessed panellines, interesting stores and more detail, but still some faults (more on that later). This modelling Report will describe how the 1/72 models of Fujimi and Hobbyboss TA-7 can be made. 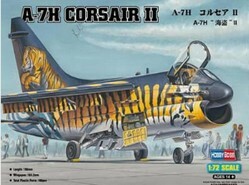 Two Fujimi kits will be made, one for a A-7A and one for a A-7E (kitno. F9 ). 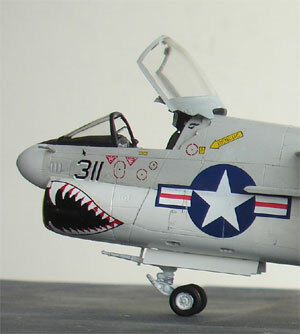 As I did not have a A-7A kit, I used the A-7B (kitno. F10 ) for the "Barn Owls" and did a small adjustment myself. The number of parts in each Fujimi kit is about 90 and depending on the box and version you get different decals. 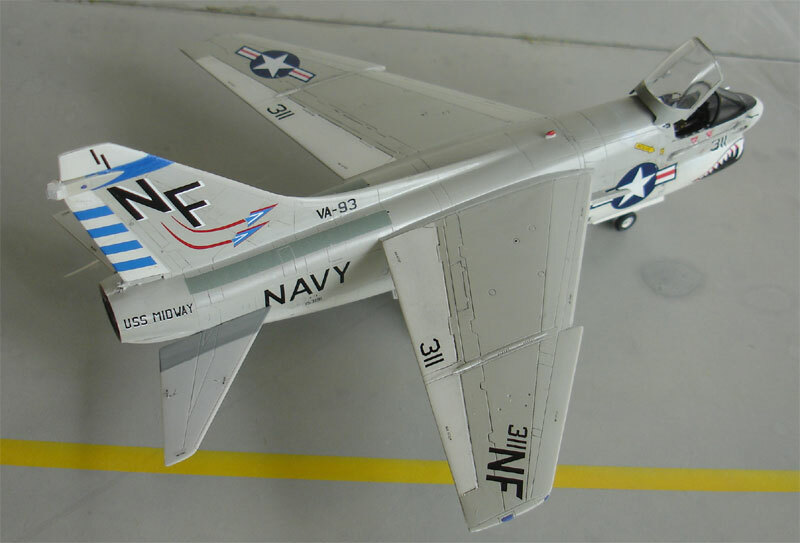 The A-7E has an extra sprue with fairings, with some smaller parts including the in the seventies applied A-7E Upgrade cable ducts on the fuselage sides. Also, stores are in most kits: 2x AIM-9B Sidewinders , 2x 300 gallon drop tanks and ejector racks. 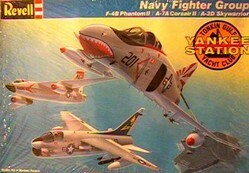 The A-7E kit has also Mavericks, whereas the A-7B has Mk-82 Snakeye bombs. The basic fit for all kits is OK, but the intake and its airduct needs work to fill all gaps which is an awkward job to do. On the other hand, the wing-fuselage joint is very good. The cockpit detail is a bit bare to current standards. modelling the Fujimi kits is very easy and straight forward. The cockpit tub can be detailed later on, only the intake ducting needs filling and sanding to hide the gaps. The canopy aft hinge mechanism is not really present in these kits, so adding some detail is worthwhile. A couple of Neomega resin seats were used, although the kit seats are also OK when detailed. Regarding the fuselage halves, the small launchbar storage bay in front of the nose leg is not present, cutting out this small bay would be nice and boxing it in. The main gear bays are moulded into the fuselage halves, which is OK. Adding some details for tubing and brake wires would be nice as the bays are rather bare. Make sure to check the configuration of the vertical tail fairings at the upper aft training edge and at the lower fin base. The fairings depend on the particular A-7 variant. Fujimi provides several optional parts for this and sometimes you have to cut off some bits. Some applies for the guns, with the Fujimi A-7B kit indeed having two guns in the intake area, whereas later variants have a single gun fairing on the left lower forward fuselage area. I decided to make a A-7A out of this kit, with only minor differences between the A-7A and A-7B. The A-7A has a fairing under the rudder-tail junction; so aft of the base Fujimi part #49 a small piece of card was used to add this. Early A-7 also has the A30 seat for which the kit seat is good enough. Otherwise, the kit assembly was straight forward. After the fuselage assembly was ready, some amounts of putty were used in some areas. Not to put too much work was done on the intake tunnel, a protective cover will be made from thin card. But the nose gear bay was 'boxed in" with thin card. I opted to keep the wing halves during assembly separate as they fit quite well. This was done to make spraying the model easier with lower white surfaces and gull grey upper surfaces and to limit masking. Sanding was done and when this was ready, the fuselage with the wing halves were ready for spraying. An overall light grey base coat of Revell acrylic 75 was sprayed on to check for any flaws. The pylons, stabilizers and gear doors were also sprayed separately. The A-7 US Navy basic colour scheme is the USN Gull Grey FS16440 and white lower surfaces FS16875 scheme. First a matt white coat using Revell Acrylic 05 followed by a gloss coat with Acrylic 04 was sprayed. The demarcation line and flying surfaces masked off with TAMIYA masking tape and the gull grey sprayed on using acrylic Gunze Sangyo no.315 for the FS16440. A gloss coat of Johnson Future/Pledge was sprayed on to get a good gloss decal undercoat and the models were ready for decalling. 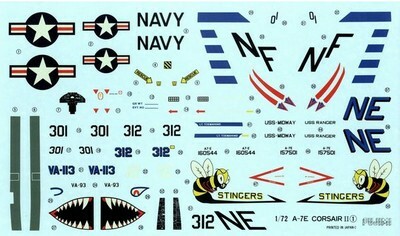 Decals came from both the kit decals and Microscale sheet #72-162 for several US Navy models. The Fujimi kit decals are OK, but I did not like the colours of the US "stars-and-bars". I used Microscale set #72-84 replacements. 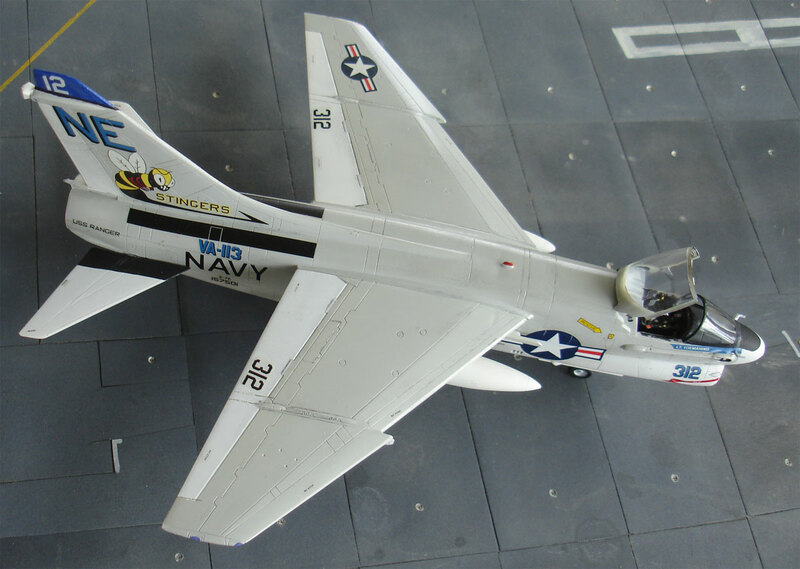 The A-7A was finished in a scheme of US Navy squadron VA-93 "Blue Blazers" from USS Midway with the code "NF". The Microscale #72-162 decals were used for this purpose. 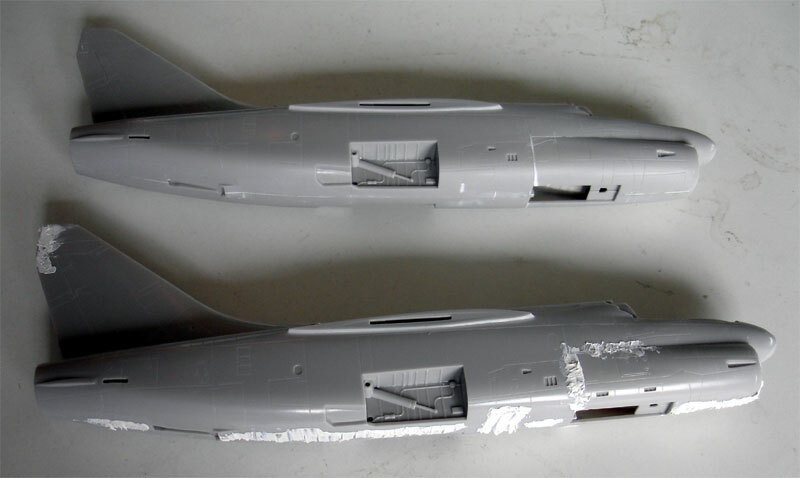 The stabilizers and aft fuselage have grey walkways for which for the fuselage decals were used from both the kit and Microscale and for the stabs a walkway was painted. 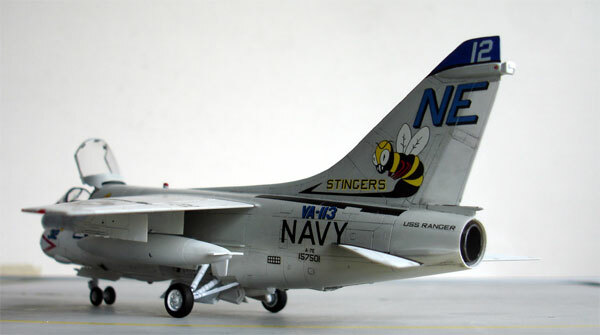 The A-7E was finished in a scheme of US Navy squadron VA-113 "Stingers" of USS Ranger using mostly kit decals. Here the stabilizer and aft fuselage have black worn walkways. On both models, the final assembly was done in a similar way. The wing halves were added, and very little white glue only needed to fill the tiny gap at the wing-fuselage junction. This line was painted gull grey with a fine brush. 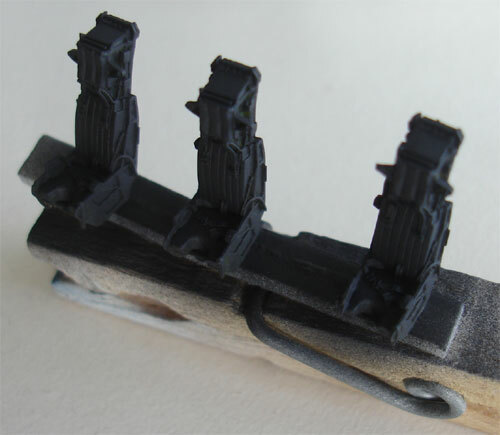 The gear legs were fitted and some tiny detail added with stretched sprue in the bays. The gears were painted with, with metallic oleas and the tyres tireblack and the wheelhubs white. The gear doors were also added. The horizontal stabilizers are often seen a bit tilted down on Corsair planes at rest, so I cutt in a bit the stabilizer attachment lips and twisted carefully each stab relatively to the lip. They can now be fitted to the rear fuselage tail section. The launchbar part on the nose leg part #45 is solid. Cutting this off and making a new one from strip would add interesting detail to the model. Time now to finish the cockpit details, with basic light grey cockpit colours and black instruments for which decals were used as in the kit and with some spare decals. Detailed seats can be bought from Pavla, Neomega or True Details. I simply detailed the kit seats with straps from tape and adding bits. Inside the tilting canopy also the mirrors were added from cut thin metal (3 for pilot). The cockpit canopy was painted light grey inside and gull grey outside with a fine brush. Both models were completed by painting the anti-collision/ navigation lights and smaller antennas and 2 nose pitot tubes and fixing the canopy. Some stores (also from the HobbyBoss kit) were added as well with their pylons. Some drybrushing was done in areas as well as adding some darker wash in flap and rudder panellines. Again a coat of Johnson Future/Pledge was airbrushed on both models to protect the decals and have a nice even sheen.